I am sat on a lay-over in Barcelona airport, mid way on my trip from Tenerife to Palma Mallorca and a new job working aboard an 80m superyacht, all part of my 5 year plan. As I hunch over my laptop and type I feel a tightness in my shoulders and back, my skin feels like the texture of crispy chicken and whenever I walk I feel the rubbing in my deck shoe of a cut I sustained surfing yesterday. I don’t care, they are the physical memories of a magic surf session. That will likely be my last for a while as Mallorca is not known for it’s surf. I will be living aboard the yacht though and this summer my goal is to add another string to my waterman’s bow and learn to Kitesurf, in my bag my swim fins are packed too on the off chance some bodysurfing is possible. The yacht also has windsurf equipment and a wakeboat so I can do some wakeboarding too. Non of that could compare to yesterday’s session though. The waves were not big, but the right hand reef break at Derecha de Fitenia was firing….. Head high, glassy perfection shared with two surfed buddies who I hadn’t seen in a long while. It was coincidence that we met up in the water, another gift from the ocean perhaps. We caught wave after wave, some sets even allowing us to catch two waves a piece, one from the outside peak and the second from the inside bowl. I felt so in touch during that session that I can’t really describe it…. I caught a nice tube on the inside, which finally picked me up, flipping me and my 8 foot mini-mal over the falls and onto the shallow volcanic reef (hence the cut on my foot) but before it did I looked up as the lip curled over me and the sun sparkled through its crystal blue lip. Betting barreled like that is like getting pulled into creation itself, nothing is quite like it. I rode down the line feeling the board in perfect trim, and even made some attempts to hang five on the heavy old board. With my left foot’s toes right on the nose and my center of gravity arched back the feeling of flying with just water infront of you is surreal. I definitely want a longboard in my future board quivers!! Derecha de Fitenia doing it’s thing…. The board I rode is an 8′ mini-mal by Sunshine Shapes Australia. I call it ‘Big Red’ as the bottom and rails are bright red, a decal on the bottom says ”Ocean Therapy Model”. This could not be any closer to the perfect description as ‘Big Red’ has helped me regain something I had started to lose over he last year. That something is stoke. Stoke is hard to explain, it’s a kind of energy that comes from within and from the Ocean, a sublime happiness, a state of bliss. Surfers talk about it all the time, the Hawaiian’s know it as ‘Mana’. 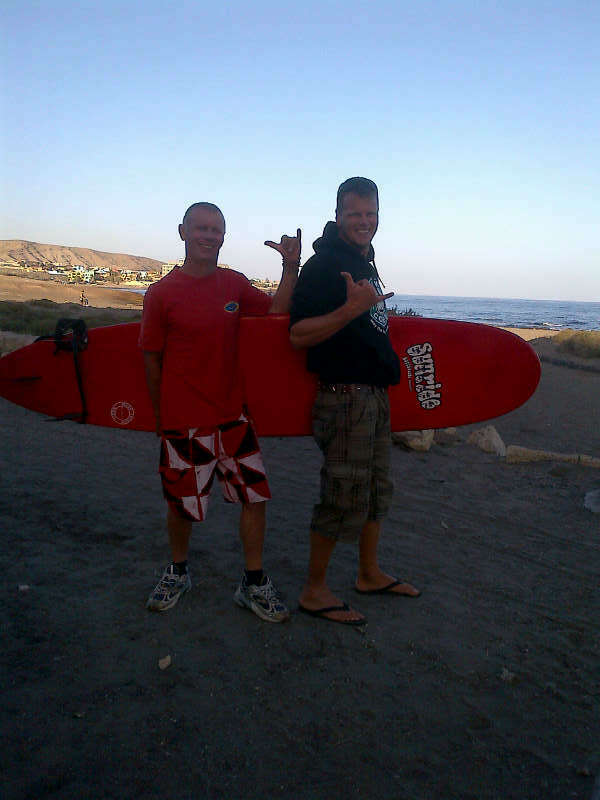 This week I shared some very small, tiny even, waves with my friend Lynn (www.thedigitalsurfschool.com) who works at K-16 surf school in Las Americas (Tenerife). Lynn is the most stoked person I know, by a long way. She is always happy, always smiling and most importantly she has a gift for sharing that passion and feeling with the surf students she teaches. That was obvious by the goofy smiles and whooping coming from her disciples on their first days surf ever. I was lucky growing up, I had it all. I started surfing at 12 and have been in the Ocean since 5 years old when my parents emigrated to the island of Tenerife. As a kid and later as an adult I would spend every free second in the Ocean, surfing, diving, spearfishing, playing around on boats and generally getting wet and burnt. One key figure in my life, and the lives of many young kids at the time, was Peter. Peter owned the LA (Las Americas) Surf surf shop. It was tiny, and overflowing with wetsuits, leashes, boards etc, in short it as like an Aladdin’s cave. Photos of Peter on trips to Hawaii and Indonesia clung to the walls, amazing feats on surf and windsurf boards alike. I would spend hours there, chatting and soaking up any detail I could. He would give me posters, old magazines and bits and pieces as well as tips in the water. The shop is gone now, part of my past is now an ugly disco smelling of stale urine and smoke. But Peter is still here, giving the gift of stoke. I caught up with him last week as he sat in the back of his van, surrounded by local kids who laughed and joked, full of his infectious stoke. He lends his battered board collection to them so that they can enjoy the Ocean. Some of the boards are yellowed, patched and waterlogged, relics from another time. I was touched by his willingness and selflessness, I saw myself in those kids. It was then that I decided I wanted to help him pass on that gift. I knew I was leaving for Mallorca in a few days and hadn’t decided where to store ‘Big Red’ anyway. When I broached the subject with Peter his eyes lit up, followed by the words ”but you know it would be for the kids, right?”. So now ‘Big Red’ lives on, bringing it’s therapy to what I hope will be the next generation of surf stoked kids under the care and guidance of Peter. As I handed over the board to him I told him of my future plans, my 5 year goal. He laughed and said ”Don’t dream, just live the day and do”, classic Peter. Handing over ‘Big Red’ to Peter (on left), hoping to inspire the next generation. I honestly cannot think of a greater gift that I can give than to share that passion which infects me. This week I also took my 65 year old mother (www.islandmomma.wordpress.com) out on a tandem stand up paddle board (SUP) session, taking us into some small beach break waves. She started off scared as the board rolled and accelerated, but after the first few waves the stoke was clear, almost visibly dripping from her like the salt water. After our last wave deposited us the beach she cried ‘wow! I could hear the wave really roaring behind us’ as a smile shaped her face.I am proud of her for facing her fear of water and happy to have had the opportunity to give back to someone who has given so much to my brother and I. 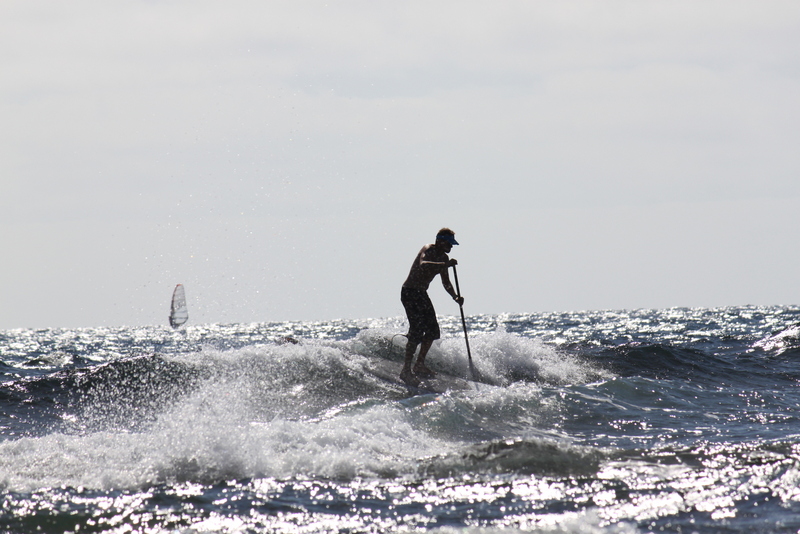 Later that day I took my best friend, Miguel Angel, out on his first session too on the SUP. He doesn’t surf, not ever, yet he managed to catch his first waves as the sun set around us, bathing the whole scene in orange, auburn and yellow hues. Again the stoke was clear to see, despite the many falls and tumbles, radiating from us both as we paddled back to the safety of the small harbor entrance, guided by the lights of the town. A taste of what lies in store for all our oceans? Support Sea Shepherd Society and watch this music video! !